It was a chilly blustery day. After the warm sunshine of late summer in the north this weather came as a shock to the system. Newark Beach in Deerness is a beautiful sandy bay with stories of a summer mermaid from the 1890’s. At high tide its personality changes, scattered with large pebbles above the high tide mark and not a mermaid in sight. Every colour of the rainbow stretches along the high tide line in the jumble of fist sized pebbles. Blues and golds mixed with browns and reds. A rainbow of colour on a dreary day. 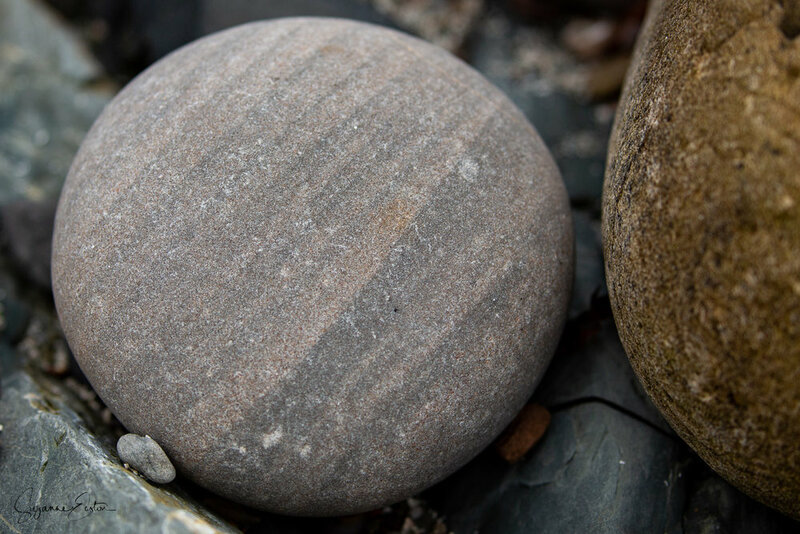 Each pebble turned by the tide and smoothed by its constant journey over thousands of years. Seaweed clinging to the boulders, drying in the persistent wind before returning to the water with the return of the tide. Newark Beach is signposted from the main road opposite Deerness Stores. The single track road goes downhill to a small parking space just before the sand dunes and a small slope onto the beach. There are no facilities here! From Newark Beach there are views towards Copinsay and the lighthouse and is the start of gentle walk along the coast to the Point of Ayre. The beach has pebbles to explore as well as rock pools, gentle sand dunes with wild flowers and a wide sandy beach. A real mixture and lots to explore.